FRUITFUL TALKS – Top executives from the Grand Bahama Chamber of Commerce met with the Minister for Grand Bahama to outline their plans for 2014. 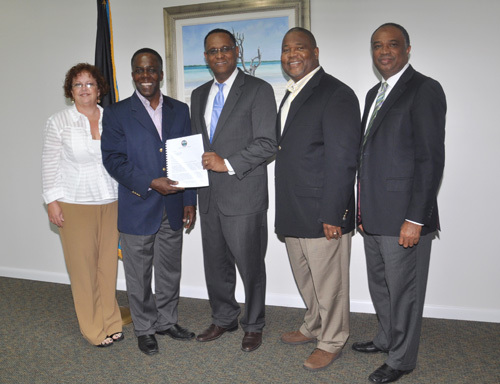 Pictured from left: Mrs. Leigh Tarmath, first vice president, GBCC; Barry Malcolm, president, GBCC; Dr. Michael Darville, Minister for Grand Bahama; Kevin Seymour, director, GBCC; and Melvin Seymour, permanent secretary, Ministry for Grand Bahama. FREEPORT, Bahamas – The Grand Bahama Chamber of Commerce and the Ministry for Grand Bahama have forged a good working relationship, designed to further the growth and development of Grand Bahama Island. The top brass from the Chamber, inclusive of President Barry Malcolm, Mrs. Leigh Tarmath, first vice president and Kevin Seymour, director, met with the Minister for Grand Bahama Dr. Michael Darville February 24 to discuss Grand Bahama’s future. The Chamber recently installed a new slate of officers, with Mr. Malcolm returning as president. Dr. Darville said he was pleased by the visit of Mr. Malcolm and his executive team, and happy to see them move swiftly with their agenda for 2014. “I have had the opportunity to speak with Mr. Malcolm concerning some of his plans and goals for the new year and I am pleased to say that I am willing to work hand and hand with the Chamber as they address some of the concerns affecting the business community on the island of Grand Bahama,” the Minister said. Responding, Mr. Malcolm said the Chamber also looks forward to working with the Ministry during the course of the next year. “As you said, we have hit the ground running.There are so many issues that require the attention of the business community here in Grand Bahama that we have a full agenda planned for 2014. As we have done in the past, we shall consult with you and share with you our thoughts, our vision,our views, what needs to be done to move the Grand Bahama economy forward. “As a Chamber and as persons invested in the community, as business people, we are here because we are bullish on Grand Bahama. We feel that Grand Bahama has tremendous potentials still and much can be done to turn the economy of this place around if we focus in and work collaboratively as a team to make it happen. So we look forward to working with your Ministry over the next 12 months,” he told the Minister.